Llanes, Rural house in farm, full nature. SPECIAL OFFER: FULL WEEK AUTUMN-WINTER 500 €. Halfway between the beaches of Llanes and the Picos de Europa National Park, an ideal place to rest and get to know the east of Asturias. So that your holidays are a real retreat where to disconnect, La Portiella offers you a place of rest without noise, without television, without WIFI and without light pollution in the middle of nature. Ideal for walking, reading, enjoying the scenery, getting lost in the tranquility of the corners or participating in the activities of the farm. Ideal for families with children. It is informed of itineraries from the farm itself for hiking. The house is more than 100 years old; It has been totally renovated in 2011, but maintains all its character, with the original oak and chestnut beams and walls that combine limestone with sandstone. Inside the decoration is simple, with some antiques, and fully equipped. Distributed on one floor, it has a large living room with fireplace and integrated kitchen, from which you exit to a typical Asturian corridor; three double bedrooms; two full bathrooms, one located inside the master bedroom with shower and the other with bathtub. From all the rooms and from the garden there is a beautiful panoramic view of the valley, the mountains and the forests that surround it. The house has a large garden overlooking the forest, with barbecue and table to eat. We spent 10 nights at La Portiella with our two young children and some grandparents. Spectacular scenery and well-situated for exploring the Picos de Europa or any of the coastal towns, we found beautiful beaches and great walks very near by. The house is beautiful and well-equipped. Our hosts were wonderful, full of warmth and knowledge about the area, and keen to show us their way of life. Thank you for the chorizo, honey, eggs and cider. Our daughter especially enjoyed helping with the animals (horses, pigs, chickens, rabbits) and loved spending time with Juan and family. Very special thanks for helping us when our car broke down, we would have been lost without the help of Marta, Juan and their sons in communicating with the garage. Juan even drove us to pick up the car and explained everything to us. Overall a truly unforgettable holiday, and we are looking forward to staying with them again. Alex and his beautiful family have been great hosts. Respectful of the house and the surroundings. Clean, tidy and very friendly. It has been a pleasure to have them chosen our house for their holidays in Asturias, specially his little girl!!. We would love to host them again. Marta and Juan were great hosts and this house is lovely. Thank you for a wonderful time. Our family of four loved our fortnight staying here. The location is superb and the views from every window are breathtaking, changing daily. Our girls (4 and 8) liked helping on the farm, feeding the pigs and checking on the bunnies and chickens. The accommodation is very clean and simply furnished and comfortable. There are walks which start from the farm, you can walk to a local bar, through the woods or up to the crest of the hill. The farm is well situated for exploring. In 40minutes you can be in the foothills of the picos, we liked the lakes at covadonga and the funicular at bulnes. In the other direction there are beautiful beaches, our favourites were at cueva del mer and poo, both within 30 minutes. Further, within an hour, you can be at comillas. An ideal situation. Marta and juan were friendly and helpful, sharing advice on where to explore as well as cider and farm grown produce. We left feeling relaxed, refreshed and rejuvinated . . . . .and planning our return stay! We are very glad that you spent a nice holidays with us. We won´t forget you , your cute girls, welling to participate in the farm duties everyday, and you nice green historic car. We like to welcome families like you that enjoy the calm and relax of being in nature, and the country way of living. We wish you a best winter, and we will be very happy to welcome you any other time. Total tranquility but only 15 minutes from the little town of Posada and half an hour to many beautiful coastal beaches. . Marta and Juan have an idyllic home in the mountains living the good life on their self sufficient organic farm. Juan's enthusiasm and philosophy for the way he chooses to live his life is admirable. We loved it. Eating Juan's amazing chorizo and drinking the famous Asturian sidre to the sound of cow bells was.a joy. this is a place I would love to return to. Truly wonderful. Dear friends, Thank you for your nice words. It´s been a pleasure to have you home and to share with your our little world, our feelings and our way of thinking. We have felt you as relatives from another country coming to visit us. Wish you can come over again. We spent a wonderful Christmas and New Year at Marta's farm. Thank you for the Christmas tree. It was very interesting to find out about the ecological philosophy on which the farm was based. Everything that was said made so much sense. The animals were in beautiful condition and the local produce, in particular the meat, was delicious. My son-in-law, a chef, was very impressed by the quality. I particularly enjoyed using the fresh vegetables from their kitchen garden which they allowed us to use. The house was very comfortable and provided everything necessary for the stay. It was very clean and well taken care of. It provided a very necessary break for us city folk to unwind and detox. There were some really interesting visits and Marta told us about some speciality restaurants in the region which served up the delicious Asturias products cooked to perfection. We hope to repeat our experience next Christmas season. Thanks to Marta and her lovely family for sharing their lives with us. Thank you for your nice comment, you´ve been very kind. It´s a pleasure to host guests like you. Hope you can join us again, you know you´ll be very wellcome any time. Marta and Juan are extremely friendly, helpful and warm people. The rural house that we stayed in is very comfortable, cosy and well designed. We have not slept so well in many years. The surrounding area is breathtakingly beautiful, rustic and very peaceful. The house is located on a charming working farm and Juan and Marta are always happy to show people around. I had a fantastic hike in the mountains with Juan, which was a truely unforgettable day. He is very knowledgable with regards to local Asturian history, culture and traditions. 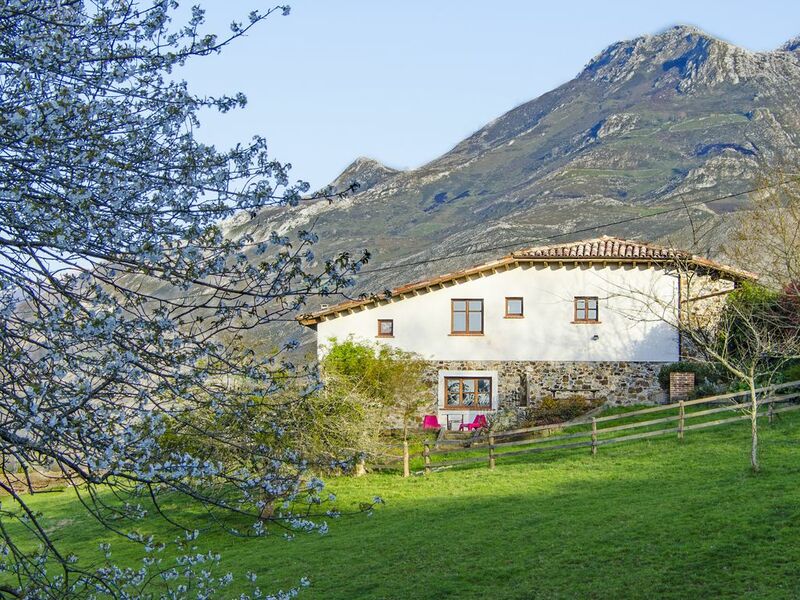 The house is ideally located, with lovely beaches, good restaurants, interesting quaint Asturian villages and the Picola De Europa being in close proximity. Marta and Juan have extraordinary children and it was a real pleasure to see them helping their parents out around the farm. It is one of the best holidays we have ever had and we will without doubt be going back to stay with Marta and Juan in the hopefully not too distant future. We cannot speak more highly of our stay with this genuinely lovely family. Highly highly recommended. Dear Gavin and Shanie, your words have been very kind!! We really appreciate your friendliness. For us it has been a pleasure accommodate people like you, the perfect guests. La Portiella is located 2 km from the village of Villa that is in the Valley of Caldueño, in the Sierra del Cuera, within the council of Llanes, on the eastern coast of Asturias. It has about 30 inhabitants. It is a very rural village, where its tranquility and authentic taste are one of the attractions that make it an ideal village to visit. For nature lovers it offers the possibility to penetrate in mysterious forests of great charm and to realize idyllic routes leaving directly from the house by the valley of Caldueño and until the Mountain range of the Horn. La Portiella is 15 km from the best beaches of Llanes (Niembro, Torimbia, Barro, Celorio), very close to the Picos de Europa and Covadonga National Park (23 km from Arenas de Cabrales and 30 from Cangas de Onís) . In the area you can go hiking, mountain biking, caving, horse riding. Just half an hour from the golf course of La Cuesta, Andrín, LLanes. Golf: La Cuesta Golf Course in Andrín Llanes only half an hour drive from the house. PRECIOS ESPECIALES PARA PAREJAS EN TEMPORADA BAJA, 1 SEMANA/400€ CONSULTAR OTRAS OFERTAS PRECIOS ESPECIALES LARGAS ESTANCIAS. SE RECOGE UN RESERVA DEL 30% SE RECOGE UNA FIANZA DE 200€ QUE SE DEVUELVE A LA SALIDA SI LA CASA SE DEJA EN EL MISMO ESTADO EN QUE SE ENCONTRÓ.